This data is feed to script side through a dynamic script. It doesn&apos;t load this data with List services we handled recently. We couldn&apos;t use a simple [LookupScript] attribute on a row class here, because there is actually no country table in Northwind database. We are collecting country names from existing records in Supplier table using distinct. We should filter its query by current tenant. But this lookup class derives from RowLookupScript base class. Let&apos;s create a new base class, to prepare for other lookup scripts that we&apos;ll have to handle later. This will be our base class for multi-tenant lookup scripts. We first set expiration to a negative timespan to disable caching. Why do we have to do this? Because dynamic script manager caches lookup scripts by their keys. But we&apos;ll have multiple versions of a lookup script based on TenantId values. We&apos;ll turn off caching at dynamic script manager level and handle caching ourself in GetScript method. In GetScript method, we are using TwoLevelCache.GetLocalStoreOnly to call base method, that generates our lookup script, and cache its result with a cache key including TenantId. See relevant section for more info about TwoLevelCache class. By overriding, PrepareQuery method, we are adding a filter by current TenantId, just like we did in list service handlers. We just called AddTenantFilter method manually, because we weren&apos;t calling base PrepareQuery method here (so it won&apos;t be called by base class). Please first delete Northwind.DynamicScripts.cs file, if you have it. OrderShipCityLookup, OrderShipCountryLookup. I&apos;ll do similar changes in them. Change base class to MultiTenantRowLookupScript and call AddTenantFilter in PrepareQuery method. We now have one more problem to solve. If you open Orders page, you&apos;ll see that Ship Via and Employee filter dropdowns still lists records from other tenants. It is because we defined their lookup scripts by a [LookupScript] attribute on their rows. By default, LookupScript generates a lookup instance based on RowLookupScript<> type. We need to change it to MultiTenantRowLookupScript<> for these multi-tenant rows. Let&apos;s fix employee lookup first. Replace [LookupScript] attribute like below in EmployeeRow. 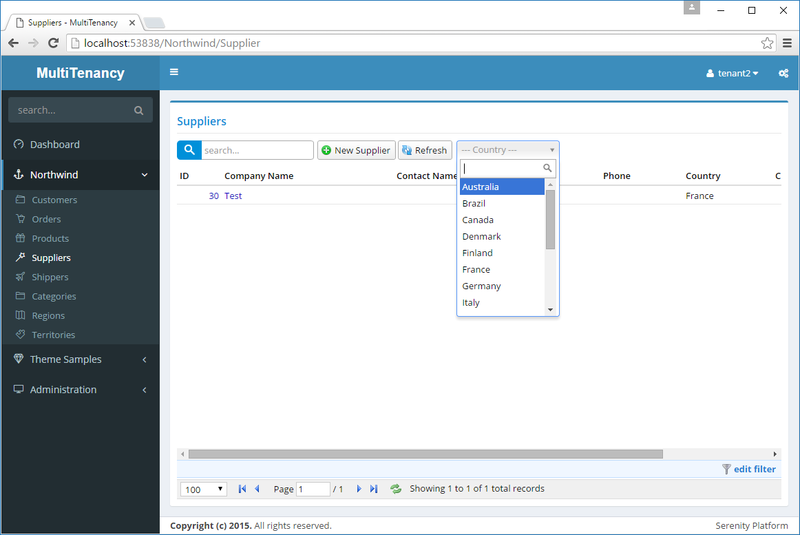 Do similar (add LookupType) for Shipper, Product, Supplier, Category, Region and Territory rows. There might be some glitches i missed, report in Serenity Github repository if any.